The Eclipse terminal makes all types of payment transactions easier by processing a variety of noncash transactions in one integrated package. Merchants no longer need several terminals to process and authorize checks, credit and ATM/debit cards, or electronic benifits transfer (EBT) transactions, because the eclipse does it all. The Eclipse terminal is the enabler for the TeleCheck® Electronic Check Acceptance (ECA) service, which converts paper checks into electronic transactions and automatically deposits the funds directly into a merchant's account. As an added bonus, the Eclipse has a built-in receipt printer, so no additional equipment is needed. 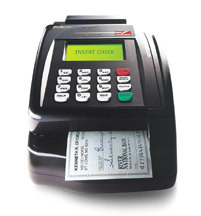 Built-in inkjet receipt printer Practical, durable and compactly designed to reduce countertop "footprint"
Converts paper checks into electronic transactions with added precision, reducing the risk of error and fraud. In addition to Ignite Payments's standard warranty package, a one-year membership in the Ignite Payments Merchant Club allows vendors to enjoy the benefits of free service, parts, labor and guaranteed equipment replacement within 24 hours due to fire or theft.